"1000's of gigs... one brand... that's versatile. I've been with Yamaha for over 15 years and I still haven't heard any drums I'd rather play. You know its good when sound guys get excited!" Over the past 15 years Mark has established an enviable record as a professional drummer throughout Australia. With vast experience across many different genres, Mark has remained in constant demand at the highest level. As a sideman, Mark has worked with many of the counties leading artists such as Anthony Warlow, Tina Arena, Petula Clarke, Todd McKenny, James Morrison, Jon English, Rhonda Burchmore, Marina Prior, QSO, Deni Hines, Troy Cassadaley, Julie Anthony, Doug Parkinson, Peter Cupples, Venetta Fields, David Cambell and many more. Over the past 10 years Mark has been heavily involved with many varied large scale touring music theatre productions such as Miss Saigon, Respect, Dusty the Original Pop Diva, Dirty Dancing, Todd Mckenny Live, The Producers, We Will Rock You, Mamma Mia, Singing In The Rain, Boy From Oz, Jolson, Les Miserables, HMS Pinafore, Pirates Of Penzance, and The Mikado. In addition to this, Mark has played/toured throughout Taiwan, New Guinea, China, Indonesia, Singapore and Malaysia with various projects from corporate events to jazz festivals and played on many television programs throughout Australia. Mark has always tried to maintain a busy teaching schedule and has taught in some of Australia's leading schools and institutions such as Hailebury College (Melbourne), All Saints Anglican (Gold Coast), Australian Institute Of Music (Sydney), and is currently teaching drums at Cannon Hill Anglican College and Brisbane Boys Grammar. 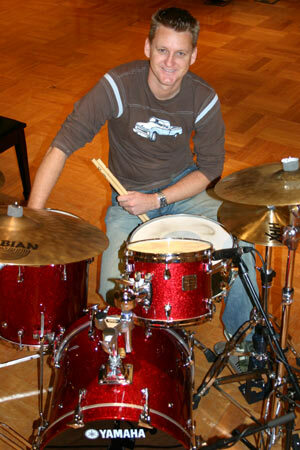 Mark has also conducted many drum clinics and masterclasses from Cairns to Perth and many stops in between.